Everything you need from brushes to mops to buckets and more. All of our cleaning supplies are in stock. 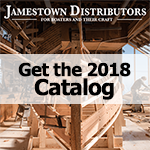 Keep your boat clean with some help from Jamestown Distributors. Scotchbrite, spray bottles, and more should be on everyone's list for supplies they need to keep their boat clean this summer.